Will my eBooks make money? Will my PRINT books make money? I’m a student, can you convert my text books to eBook form? As a rule, no. We can only create eBooks under the instruction of the person or company that owns the copyright to the book. You can contact the publisher and ask them to get in touch with us if you like. Do I OWN the eBook files after you have converted them for me? Yes, absolutely. You’re free to sell the eBooks wherever you like, for as much as you like. The only thing you can’t do is take the files apart and use our technology for yourself. How long will my eBook conversion take? Depends on the book and the time of year. It tends to get VERY busy between November and January, but for a run-of-the-mill novel, we can usually get it turned around in about a week, usually less. Why is there a charge for adding an index? Don’t confuse that with the table of contents. Unless it’s incredibly complex, that bit’s free. If your book has an index section, then what we do is convert all the page numbers into hyperlinks to the equivalent place in the eBook where that page can be found. There is no such thing as a true page number in an eBook because the pages change depending on how big the screen is, what size text the reader is using etc. So, we need to create links for the hundreds, usually THOUSANDS of page references in an index. Happily, we have our own software that we developed to do most of the hard work – our technicians then go through the resultant index to check that it’s all working and that simply takes time. It’s not a perfect system though. As we said, the pages in an eBook are a different size to the original printed book, so if your reference is at the bottom of a long page, then if the reader is looking at your book on a small screen like an iPhone, then they may need to flip a couple of ‘pages’ forward until they reach the referenced wording. Some people prefer to simply leave the index out to save costs and rely on the search facility that’s in most reading software. But if yours is a technical book that’s been carefully indexed then it may be worth adding an eBook index. I’m sure everyone recognises the 13-digit number on the barcode at the back of books (10-digits for older ones) as the ISBN. And you’ll know that this is the number by which the book is uniquely identified by bookstores, distributors and publishers. We think that it’s important to clarify a few things about ISBNS, particularly if you would like to buy one from us, and have us register your book or eBook. The first thing to be sure of is that when we, or anyone buys a block of ISBNs from the controlling agency, they are registered to the purchasing company and are actually NOT transferable. This means that all the ISBNs that we sell will have Oxford eBooks listed as the publisher, or sci-fi-cafe.com for our science fiction titles. This is because the ISBN is registered to the publisher and its wholly owned imprints. An imprint is just another name that a publisher can use to sell their books to a more specific market. This rule applies to EVERYONE, so do be careful if you want to buy your ISBNs elsewhere, you’ll find the company you bought the number from listed as the publisher whatever they say. Now, I’ve talked with the ISBN agency and the exciting news is that they ARE considering selling single ISBNs in 2016 and we’ll be more than happy to resell and register these to our customers when the time comes. There’s another important matter with the ISBN information that’s stored. There’s the distributor. This is a record of who to go to if you’re a bookstore and want to order a crate of your brilliant book (or download the eBook from). This can be anyone. So, if we’ve made you a print on demand book and you’re set up with an Ingram Spark account, then you can be sent the orders for the book, order them to be printed and shipped directly to your customer. You will make more money that way than if you do it through a distributor! But, if you don’t want to self-distribute, then we’ll just put one of the distribution firms (Bertram’s or Gardner’s) down and they’ll pass the order to the printers. The advantage there is that they’re listed with lots of bookstores and you might sell more books that way. At the moment, we only charge £10+vat (£12) to resell each ISBN to you. We don’t make a lot of money on these and we don’t plan to get rich with that either. It’s a handy service that we like to offer our busy authors. It’ll probably cost a little more when the time comes to register the single ISBNs as there’s going to be a bunch of paperwork to do. Just remember that the publisher will be listed as Oxford eBooks. Do I even NEED an ISBN? You will always need an ISBN for any printed books. But if you like, you can publish your eBook on Amazon without one as they use their own numbering system called an ASIN. If you DO opt to assign an ISBN to your eBook you can’t assign the same number to the ePub, Kindle version and print edition. Each version has to be different. You can publish ePubs on Google Play without an ISBN in the same way as you do on Amazon. If you want to order 10 or more ISBNs then you CAN have yourself listed as the publisher. This is the minimum number of ISBNs that can currently be bought in a block from the governing body. Actually, if you’re writing a series of books, then it’s probably worth buying a block of 10 as you’d use them up pretty quickly if you’re also planning on releasing the eBook and the print edition. If your book has complex formatting already then leave it as it is. This guide is really only for those preparing new documents, usually novels and for general information. There are no hard and fast rules for how to prepare your book files for us to convert, so if you’re unsure, just submit your manuscript as it is. Don’t use tabs or spaces to indent the first line of your paragraphs. If you’re using something like Word, InDesign or anything that lets you set up style sheets and you want to show first line indenting then try to do it that way. If in doubt, just leave it as a normal paragraph, we’ll add the formatting. Keep headings and sub-headings formatting consistent. Better still, use the headings style in Word if that’s what you’re writing in. It’ll help us to identify your heading and subheading heirarchy. Create paragraph styles in InDesign if you’re using that. Font size – unless it’s for some special effect. Font face – except where you need to be specific about serif / sans-serif in headings or fixed-width fonts. When submitting a book file in InDesign format that has an index you’d like us to convert, we may need a copy of the font files to ensure that the pagination is correct. Your eBook is going to be read on a wide variety of eBook reading devices and applications. New ones are being brought onto the market all the time and although there is a generally recognised standard for formatting, many reading devices still produce different visual representations of the same file. We have an arsenal of formatting tricks that we know work in the vast majority of cases and will adapt any complex book formatting to work across the board. There are a number of ‘safe’ formatting styles that will always work. Nested bullet points, with differing styles. fixed width (like CODE) font. Hyperlinks. Internal and external, though Apple don’t like links to other sites that sell content. Then some that will work MOST of the time, but gracefully degrade on some readers. Tables with more than 3 columns will look ugly on small screens such as iPhone. Complex tables, we’ll usually convert into an image that can be clicked and zoomed. Pull-quotes and side-boxes. Look fine on larger screens if they’re not too big. Numbered lists are fine and USUALLY you can have numbers, letters and roman numerals, but the latter may turn into normal numbers on some readers so will cause problems if you refer to point vii and it’s shown as point 7. Don’t be too concerned about whether the text is justified or not. Some reading devices will set the justification or allow the user to apply their own settings. The same is true for the body text font. When you (or your readers) buy an eBook from the big online retailers, they transmit the eBook to your reading device or application automatically after completing the purchase. In the case of the Kindle, it all happens wirelessly and smoothly. When we send you your completed eBook files, we will give you an ePub file, and a MOBI file (eg: MyBook.epub and MyBook.mobi) . These are in the UNPROTECTED form and can be copied and distributed freely. When you publish your book, the distributors will usually apply protection to the file to stop unauthorised copying or lending. 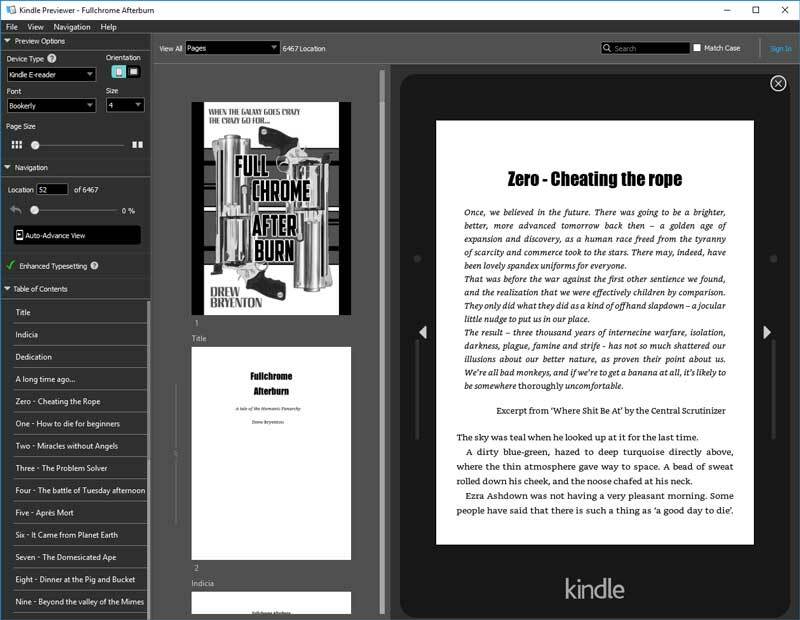 You’ll no doubt want to take a look at your new eBook to see how it looks before publishing. This article explains some of the most simple ways that you can do this. It also applies to anyone who finds themselves with an eBook file and want to be able to get it onto their device or application. This is a free eReader application from Adobe. It runs on PC and Mac. They also have a small selection of sample eBooks for free to download. Older versions of this don’t support all the fancy formatting that can appear in eBooks (like shadows, small-caps and some extended characters), but it’s a good and generally reliable eReading workhorse that’s quick and easy to use. Once the application is installed (and if set as your default reader by ensuring that “Associate .acsm and .epub file types” is checked during installation), just double-click to open your eBook file as you would any other file. We recommend that you make the application window about the same size and shape as a paperback on your screen for easy reading. If you open the application to full screen then odd things can happen. 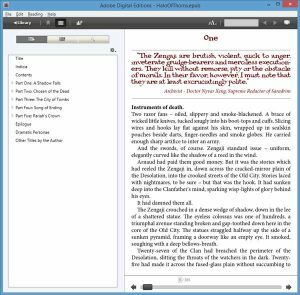 If you’d like to see how your eBook will look on the different types of Kindle, then the Kindle previewer from Amazon is what you need. It’s also free to download. And will work for both PC and Mac. Opening your files is simple. Just open the application and drag the MOBI file into the window it’ll load automatically. Your MOBI eBook file has been specifically optimised to work with Kindle readers and although it will load ePub files, we recommend that you open the MOBI file otherwise it will attempt to convert the file when it loads. You can select a number if different Kindle devices and applications. Amazon have a new piece of software that you can download which allows you to send a MOBI file to your registered Kindle device or Kindle application on your other devices (iPad, laptop, phone etc). Then just open a file explorer, locate your file and right click (for Windows) on the MOBI file then click on “send to Kindle”. It’ll then be sent directly to your device to be read in the Kindle APP. You can choose to send to more than on device if you have them registered. Although the previewer is pretty accurate, some people (us included) like to see it for REAL. If you plug the USB cable in from your Kindle into your PC, you will be able to access it just like a USB memory stick or external hard drive. Browse the Kindle in your file browser and simply copy your MOBI file into the DOCUMENTS folder. If you want to organise your files, you can make sub-folders. Unplug the Kindle’s USB cable and then wait a couple of seconds for it to find your new file. It’ll appear at the top of the list for you to read. Now, this is where it gets a little tricky, possibly due to the way that Apple control content on their devices. 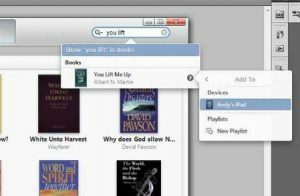 To copy an ePub into iBooks, first connect your iPad to the computer with the USB cable and open iTunes. Drag a copy of the file into iTunes. SEARCH for your ePub with the search tool. When it appears in the results, click on the little (>) that appears when you hover your mouse over it. Click on your device from the list of options. This method works for Android phones with applications such as BlueFire etc. It’s also a quick way to get an eBook file onto your iPhone or iPad. Simply EMAIL the ePub file to yourself. But here’s the trick… if you’re using Outlook then click the FORMAT option to send as plain text. Otherwise, for some reason the file won’t be attached properly on Apple devices. Then, go to email on your device and tap on the attached file. With Apple, you’ll have the option to copy to iBooks, with Android you can choose the application to read it with. How much will I make from my eBooks? There are a number of good places to publish your eBook and they all offer different rates and deals, but let’s consider the most common outlet, Amazon. We use them a lot and it works well for us. You can set the list price of your eBook to whatever you like but if your eBook is priced between £1.99 and £9.99 then they pay you 70% of that (except in a couple of countries, where they pay 35%), less a small amount for delivery – 10p per megabyte. You can read the full royalty rules on Amazon here. So: Let’s say you’re pitching your eBook at a very reasonable £3.75. Amazon might take, 4p for delivery and pay you a royalty of £2.16 for each copy sold. Overseas sales are charged to the customer in their local currency and Amazon convert that into pounds for you. Now, on to how you’re going to make your fortune. Your standard novel will cost £150 including VAT to convert if you supply us with a cover image. That’s actually not a lot to sell, is it? You can charge less for your eBook to try to sell more copies, or increase the price if your market will support it. Amazon have a little calculator that draws a graph to show what the best price they think you should pitch your book at given the genre and other things. I’ve used this myself to tweak the price of an eBook by a few pence and seen a significant improvement in returns. The nice thing is that you can change the price of your eBook at any time on Amazon to get the feel for your market. This is arguably the hardest part. There has been a lot said on the subject, but getting people to know about your book and getting people to say nice things about it are the two top ones as far as I believe. You can improve your sales by getting good reviews. If you know some people that have bought your book, encourage them to leave a review. You might even put a little note at the back of your eBook inviting people to leave a review if they like it. You’re bound to get a few silly reviews and pointless trolls so try to ignore those and concentrate on getting 4 or more star ratings for your book. A good blurb of course will help, so think up something that will get people to buy the book. Don’t be too long winded, you’ll probably lose most people after the first couple of paragraphs – so make sure you get your message across early in your text. Choose a good main category to list your book under and another relevant but slightly obscure one. When your book starts to sell you’re more likely to be CHART LISTED on Amazon much higher in the more obscure category where there is less competition there. Potential buyers will be impressed that you book adventure book set underground is #1 in the fiction>>mining category. How much money will my PRINT books make? Printed books are a bit more complicated than eBooks because a chain of people are involved in printing it, shipping it out to stores and selling it. And they ALL take a slice out of your pie along the way. If you’d like us to handle the printing and distribution of your print edition then here’s how it could go. Wait! I’m an author not a mathematician! Rather than have to fork out thousands and thousands of pounds to get crates of books printed, stored in warehouses and shipped on lorries, we use a system called Print on Demand (POD). This is a clever method where the print factory that we use will print only what you need. That can be one copy, a box of twenty or a thousand. The books are then shipped directly to the bookstore or the customer. You can order a pile of books yourself at cost to sell to all your friends. What’s more, these factories are located all around the world, so nobody needs to pay huge shipping bills on their books. Our printers are linked with Amazon, so that when we publish the book, it goes directly on sale worldwide on Amazon. What’s more, your book will also automatically be registered with a number of large book sellers such as Gardners and Bertrams. So, what costs are involved? Let’s start with the actual printing costs. This is going to be different for each book and that depends on the number of pages, whether you want colour inside, the type of paper, how big the book is, hardback, paperback. But let’s look at a real life example. One of our books is out as a 5″ x 8″ paperback with gloss cover (matte is the same price), and creme paper with black and white type. It has 208 pages. If you want to print a single copy, it will cost you £2.50. If you want to print one and send it to someone in the UK it costs £5.99 including P+P. And allow a little under a week for that to arrive. Now, it’s cheaper when you print more than one, so for example to print and send 10 copies is £31.75 (£3.18 each). 100 of those, gets you a lower printing cost too, which will see a van turn up to someone’s door with boxes of your book for £256.25 (£2.56 each) that’s less than half the price of a single one. You also need to bear in mind that if we’re managing your print account we make a small £12 (incl vat) charge for placing each order. So if you’re going to just buy one, then it might be cheaper to buy from Amazon – or let us know in advance, we’ll add the first run of stock to your typesetting bill and waive the ordering costs. Sounds good – but that’s if you’re buying and selling the stock yourself. If you’re selling your books through the book buyers network that then potentially allows EVERY book store in the world to order your book directly and you don’t pay any ordering fees. BUT… the bookstores want to make a profit and they can ask for a trade discount on your book of between 40% and 60%. The lowest we can set the discount to in the UK is 35% and 30% in the US. This all means that you need to set the RRP of your book high enough so that you make a profit. It’s actually possible to make a loss if you’re not careful. So here are a handful of examples of the returns you’re likely to make on a book like the one we’ve described when sold to book stores. (Let’s just consider the UK for simplicity). Because the cost of Print On Demand (short order printing) is more than the cost of the long runs that the big publishers produce, you will need to set your price a pound or two higher in order to ensure you make some money. This sounds complicated, how to I do this? Yes, it is a bit fiddly isn’t it? We’ll handle all that for you so you can relax. As soon as we know approximately how many pages your print book is going to come to, we will calculate all the printing and shipping estimates so that you can think about how much you want to sell your book for – or more simply, how much you want to make on each one. We will advise on a RRP and a trade discount. If you just want to sell on Amazon then we set it to 35% and then maybe some book stores will take a punt too if you’re lucky. If you want to attract the book stores then we’ll make sure that your RRP is set so that you’ll make your money after the stores take their 40% We can control the discount so you won’t lose money on sales. All that comes for free as part of our print on demand typesetting service – we’re there for you all the way because we want you to be successful. And if you want to get a couple of boxes for yourself, just say so and we’ll order them to be shipped to your door. We just ask a £12 handling fee per order and prompt payment for your books. We get paid monthly by the printers for sales and they tell us exactly what each book has earned. When they pay us, we’ll calculate your share and transfer it directly to your bank subject to a minimum transfer of £50. At present we’re not charging for calculating and transferring your money. Alternatively, if we have set you up with your own account with the printers, then they pay you directly each month into your bank account. Well, let’s keep this normal type because it’s important to know that these figures are correct at the time of writing and subject to changes from all the organisations involved plus changes in VAT laws and who knows what else. So, this is just a guide – a pretty accurate one though some of the calculations that the printers make are a little mysterious. Your book will be different, and we’ll give you up to date costs when we work with you.